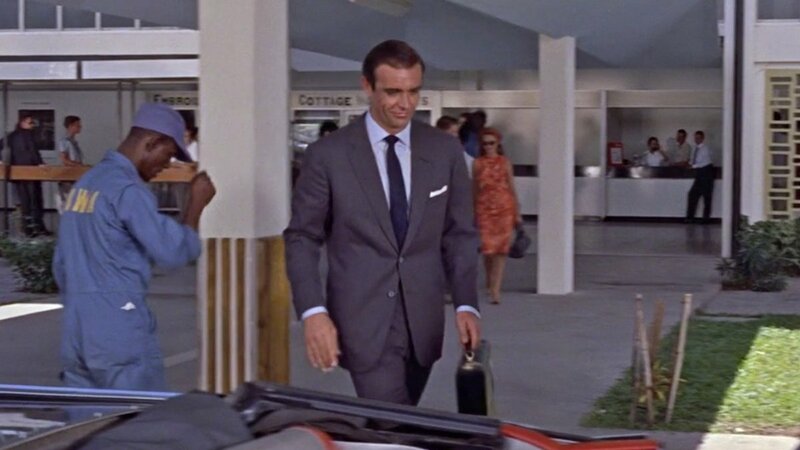 This blog previously covered the grey flannel suit in Dr. No, but not in much depth. The suit also shared the article with a suit of another cloth in the same cut. 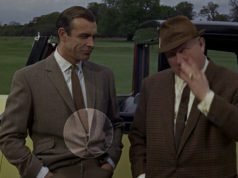 Here is a much needed closer look at the first lounge suit that James Bond wears on film. When James Bond arrives in Kingston, Jamaica in Dr. No wearing a dark grey woollen flannel suit, he is not properly dressed for warm Jamaica but rather for cold London, where he was coming from. We usually see Bond dressed for his destination when he arrives (we even see him change his clothes on the plane in Goldfinger), but dressing Bond for London in his first few Jamaica scenes establishes how the character dresses for his daily business at home. He looks a bit out of place wearing a dark and heavy suit in Jamaica, but he soon changes into something more comfortable. 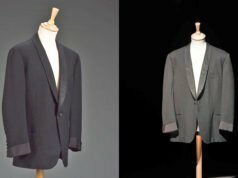 The staid grey flannel suit would go on to be a staple for Connery’s Bond, wearing it in four more of his Bond films. 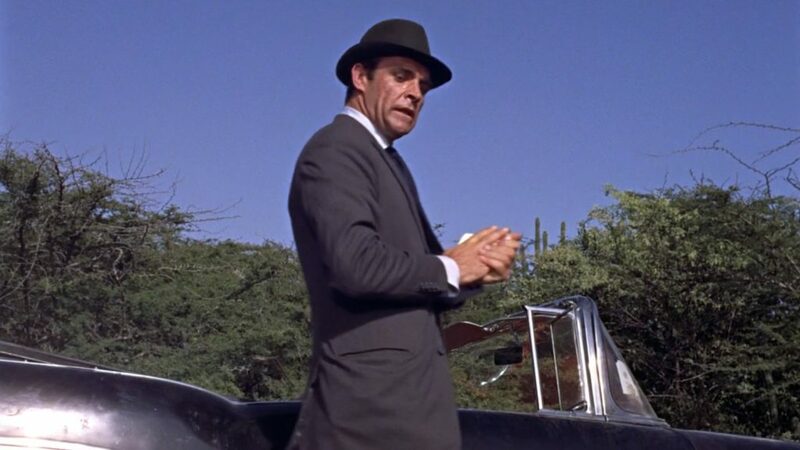 This dark grey flannel two-piece suit is one of three lounge suits—along with a light grey mohair suit and a grey glen check suit—that the budget of Dr. No allowed for Sean Connery. Dr. No‘s director Terence Young brought the new James Bond Sean Connery to his tailor, Anthony Sinclair of Conduit Street in London, to make his three suits, dinner suit, blazer and chesterfield coat for the film. This started a relationship that would last Connery’s run as James Bond. The suit is tailored in style that became known as the “Conduit Cut”, named after Sinclair’s location on Conduit Street. Sinclair himself described his suits as a “Savile Row style”, and he operated only one block from Savile Row in Mayfair. 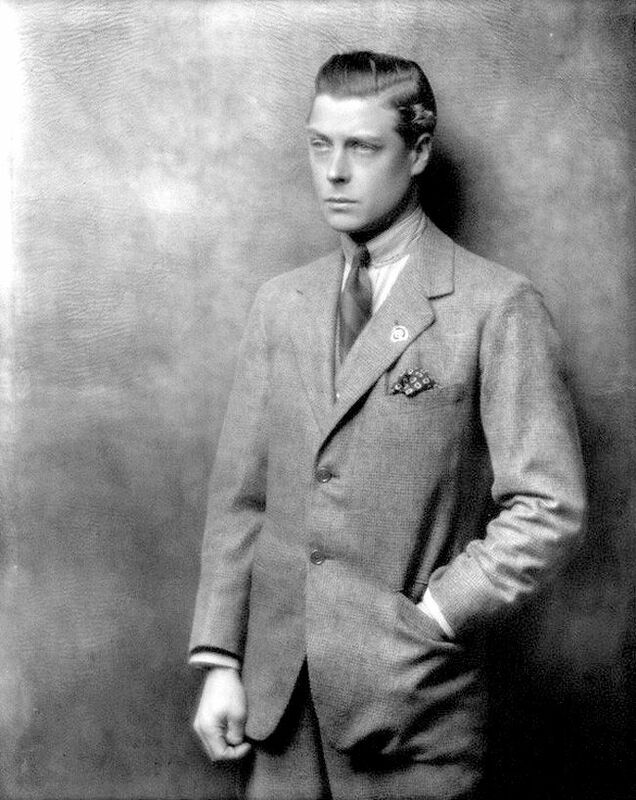 The cut of Sinclair’s suits follows a middle-of-the-road English style, neither with the structure of English equestrian tailors nor with the exaggerated drape of the English drape tailors. Sinclair’s cut was unassuming but undeniably British. 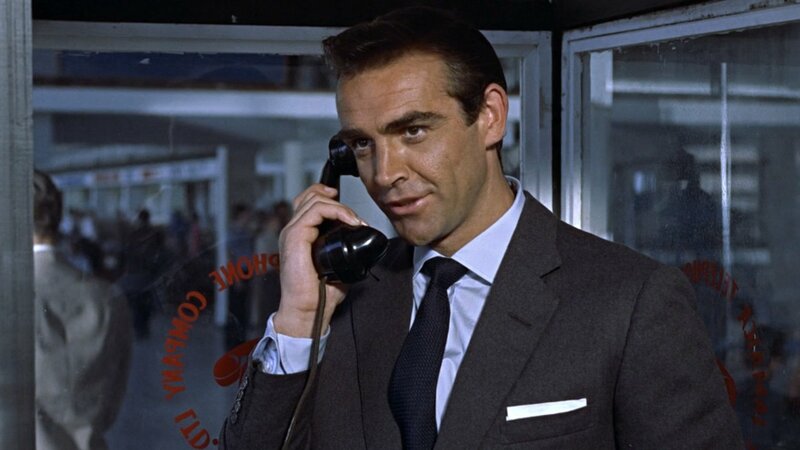 This suit established Bond’s preference for the modern button two jacket rather than the more traditional button three jacket. The button stance is at a medium height, placing it at the natural waist and giving the suit at timeless look. The lapels are a medium-narrow width, which also help this suit to look timeless, even if the lapels look a little wide in comparison to today’s fashions. The jacket is cut with soft shoulders, roped sleeve heads, a full chest and a gently suppressed waist. The chest has a bit of drape, which helps him to conceal his Walther PPK inside the jacket. The jacket is detailed with double vents, straight jetted hip pockets (no flaps), a rather low welt breast pocket and four buttons on each cuff. The buttons are dark grey plastic to match the colour of the suit. The suit trousers have a traditional English cut with a high rise to the natural waist and double forward pleats. The trousers legs taper to a moderately narrow hem with turn-ups. The waistband has an extension with a hidden hook, and on each side there are button-tab side adjusters with three buttons. Sean Connery’s Bond never wears a belt or braces with his suits, following modern 1960s English bespoke suit trends. With this suit, Sean Connery infamously buttons the bottom button of his suit jacket in one scene. This rookie mistake shows that Connery was not yet completely comfortable in a suit. Suit jackets that have a curved hem in front are designed so that the bottom button and buttonhole do not meet, and pulling them together distorts the lines of the jacket. A low budget likely meant that it was not worth the production’s time to re-shoot the scene because of this mistake. Sean Connery’s shirt is a pale blue Sea Island cotton poplin from Turnbull & Asser. The shirt’s collar is a cutaway with 1/4-inch stitching that is similar to the Regent collar they make today, but Connery’s collar was bespoke. The shirt follows typical Jermyn Street style with a narrow placket stitched 3/8 inch from the edge and no front pocket. This shirt also introduces Sean Connery’s Bond’s signature cuff, the two button cocktail cuff, which is a softly constructed button cuff that has a rounded extension that turns back over the cuff. It is a decorative double cuff that fastens with buttons instead of cuff links. With this suit Bond wears a dark navy blue grenadine tie from Turnbull & Asser, in a moderately narrow width of about 7 1/2 cm. He ties it with a Windsor knot, which Ian Fleming’s Bond despised. Since Sean Connery typically uses a Windsor knot in his personal life as well as in many other roles, it is likely the knot he prefers himself. In his suit jacket’s breast pocket, Bond wears a square-folded white linen handkerchief with ribbed stripes. The pocket square does not, and ideally should not, match the shirt. He takes his handkerchief out of the breast pocket to wipe his hands during the fight with Mr Jones. 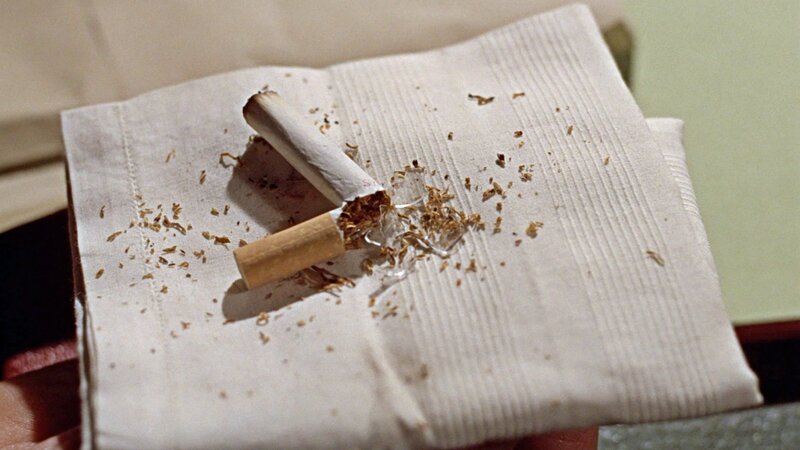 After the fight, Bond uses his handkerchief to present Mr Jones’ cyanide-filled cigarette to Pleydell-Smith at Government House. Finishing the outfit is the traditional accessory for an English businessman: a felt hat. This felt trilby from Lock & Co. Hatters of St. James’s Street—which sometimes looks dark brown and sometimes looks green-grey—has a tapered crown with a front pinch and centre dent and a narrow snap brim that is turned down in front and turned up in back. The base of the crown is trimmed with a narrow matching grosgrain ribbon. Such a hat is not meant for Jamaica’s hot weather, and Bond looks uncomfortably hot in it. He makes much better use of the hat fanning himself with it. 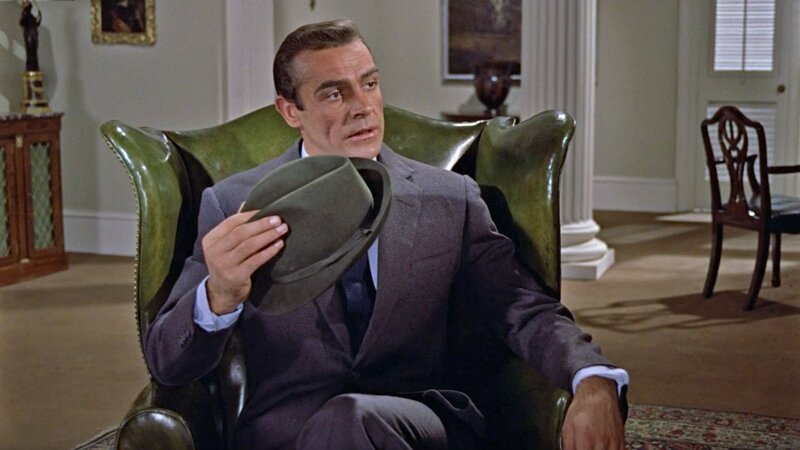 Nevertheless, the hat is effectively used, along with the grey flannel suit, to establish James Bond as a traditional London businessman. IMO Sinclair’s suits for Bond get very close to sartorial perfection. 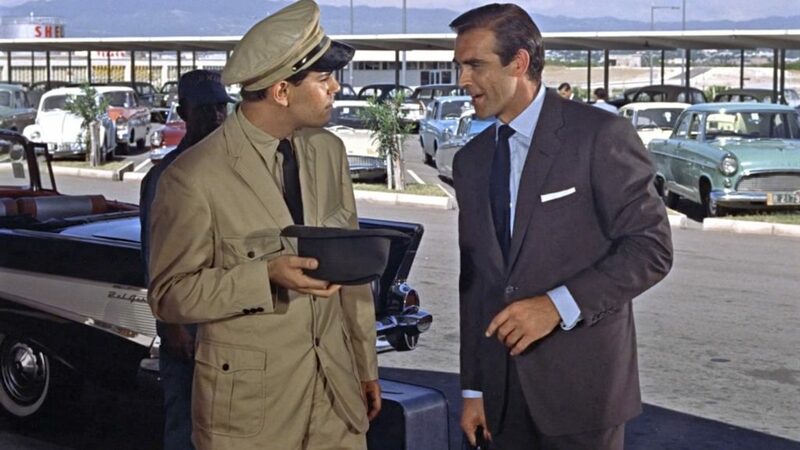 One could argue about the the Dr. No suits being a trifle too roomy and the plastic buttons, but that’s trivia. IMO Sinclair’s suits for Connery have never been topped by any other Bond tailor throughout the series. It is of course due to their timeless style and cut that they have kept up very well until today – that shows that in 1960s Sinclair’s conception was quite ahead of his time. Nowadays they have acquired an iconic status in the field of menswear – nearly every guide refers to them as prime examples for how a perfect suit should look like. Thank you Matt for giving us a deeper depth of this timeless suit with this new article. Would you also cover the light grey mohair suit? Also if you were to change Bond’s suit in these scenes what would it be? Personally, I think a light grey tropical wool suit is would what I would replace it with, what’s your take on it Matt? Yes, that one will be coming soon. The light grey mohair suit is perfect, and he should have worn that suit on arrival in Jamaica. Unless it’s a white shirt, surely? Yes, a white shirt and white pocket square go perfectly together. If it’s a white cotton or silk shirt, I think a white linen pocket square, that matches in colour but not in the same exact material, is still a good choice. What should be avoided is making the pocket square of the same exact material of the shirt. Agreed, but I think we can take this further; the same colour is fine though not the same tone or shade — or indeed the same pattern. Further, I think the “material” is not so important. What matters instead is the texture. It’s all about balancing relative visual strengths. Rules don’t always help. I didn’t feel this article was the place to get into more specific ways you can pair a pocket square with your outfit. Rules do indeed help, which is why I only mentioned the one basic rule. The pocket square should not match (the definition of “match” being “an exact counterpart”) the shirt. This also applies to the tie. There is no need to take this further. A well-dressed man should be able to choose his pocket square to complement the outfit, such as through the examples you mentioned. Rules do help, but not always. On a separate note but still on the question of rules, I’m not sure it’s a “rookie mistake” to fasten bottom button of a suit jacket or blazer. It’s certainly not my preference, but there’s an occasional justification for doing so — a very windy day for instance. That aside, the immaculately dressed Cary Grant would occasionally fasten the bottom button. See for instance him in his grey blazer in “To Catch a Thief”. I agree it’s not always a great look but I wouldn’t go so far as to call it a ‘rookie mistake’. There are reasons for most rules. If the rule isn’t helping, it probably isn’t a good rule. When Connery fastens the bottom button of the suit jacket he shows a lack of understanding of how the jacket is cut. Sure, you could fasten it if it’s a very windy day, but it will pull the vent/vents open, which will already be flapping around. Most people don’t fasten the bottom button because it’s a rule we’re told. But it is not an arbitrary rule; there are reasons not to fasten that button. I do not know why Grant buttoned all three buttons of his blazer in To Catch a Thief, but the top and bottom buttons on that jacket were designed for show and do not fasten without distorting the shape of the jacket. It’s like trying to screw in a cross-head screw with a flat screwdriver. It may work if you are very skilled, but it’s not a good idea. The point of a rule is to simplify broader principles. It’s sometimes helpful and instructive looking into those broader principles. The bottom-button rule is, as you rightly point out, about maintaining lines or aspiring to an underlying aesthetic of elegance. But there are also other broader (and sometimes competing) principles that have to do with functionality. Others still that have to do with personal style or what loosely speaking Italians call ‘sprezzatura’. All these have a trade off. Speaking of rookies, it is a good starting point to begin with a rule. But over time, one needs to transcend the rule and grasp the broader principles of elegance. Naturally, I’m expressing a view here. Nothing is cast in stone. Great article! My only concern is that I don’t see these instances as breaches of “etiquette”. Sure, they don’t conform to a pre-established standard of elegance. I prefer to see them (most if not all) as examples of individual style or personality of the various screen Bonds. It’s what makes them endearing and inspirational. I wouldn’t have it any other way. Some of them are breaches of etiquette, such as the lack of a waist-covering with black tie or moccasins with a city suit. These were breaches in Bond’s world during those times. Others were breaches of tradition or inelegant manners of dress. Matt , l noticed that this shirt of Connery’s lacks a gauntlet button . Did all of Sean Connery’s dress shirts and Roger Moore’s Dress shirts in the Bond series lack gaunlet button ? And is a lack of a gaunlet button a sign of ( relatively ) inferior quality ? On a related subject , this documentary mentions Sean Connery’s shirts as being ” Indian Madras ” , which l find a bit strange , because they look more like Sea Island Cotton Poplin to me. Turnbull and Asser even claims on their website that the shirts were sea Island Cotton Poplin. Most or all of Sean Connery’s and Roger Moore’s shirts lacked gauntlet buttons. It is not any indicator of quality. Most American shirts come with gauntlet buttons, and they are nowhere close to the quality of the bespoke shirts than Turnbull & Asser and Frank Foster made for Connery and Moore. The video is pointing out the white shirt in Dr. No to be Madras. I don’t believe that is the case, since the shirt looks too crisp and shiny to be Madras and looks more like Sea Island cotton. I think that promotional clip was only making things up. Personal choice of course but I hate gauntlet buttons. Utterly pointless IMO and not very comfortable if you lean your forearms on a desk to type, or on an aeroplane seat armrest. Matt – Thanks for going back and giving this great suit a full analysis! I personally prefer this suits’ From Russia With Love-descendants, but it pretty much sets the template for Connery’s 1960’s Bond. Near-perfection. What is your opinion on the neck size of the shirt? It looks quite roomy in the photo of him on the phone. It looks good to me. If the collar were too snug he would be uncomfortable with his neck in that position. It’s the base of the collar that matters most, where the neck is largest. I’m assuming that handkerchief got thrown away. If it had cyanide anywhere near it, I wouldn’t want to be wiping my hands on it after a future fight. welcome update, the suits in Dr No, and From Russia with Love are certainly my favorites. they are just right, and are surprisingly practical for the character. to add a little bit, i recently saw ‘To Catch a Thief’ on the big screen, if you have the opportunity to see it, its a treat. in the scene where Cary Grant buttons all of the buttons on his jacket, he is trying to fool everyone that he is an American tourist from Portland Oregon, as such it may be considered part of his ‘disguise’ and not a mistake. It’s not necessarily Cary Grant’s mistake, but if it’s part of a disguise it’s meant to look like a mistake. Talking of mistakes , if you carefully observe the scene in the hotel lobby when he’s about to go ‘house hunting’ with Grace Kelly there’s a blooper, as in adjacent edits the buttoning of his jacket changes. I think everyone here was waiting for this article, which is a real pleasure to read, even if we knew a few things already. Back to basics is always good ! You even manage to spot the kind of pocket square Connery is wearing, with the cloth and the pattern (a bit similar to the Goldfinger evening silk shirt actually) ! Matt, I have a question. Is the flannel suit in Dr No less roomy in the chest than the mohair one ? Because the cut now seems almost perfect to me. Is it the fact that the flannel cloth being much heavier or than the mohair, the weight makes the flannel hang better and thus looking a bit close in the chest than the mohair one ? Because the chest of the mohair suit jacket really looked very wide to me. Or I am just splitting hair and going insane ? And another question : does the higher button stance make the suit looking a bit less roomy in the chest than the FRWL ones ? Because they look roomier to me now than in Dr No ! You’re right that the mohair suit looks bigger in the chest, but the suits have the same cut. Heavy flannel and lightweight mohair drape much differently, which is why they look a bit different. The lower button stance in From Russia with Love certainly accentuates the chest and will make the jacket look bigger. I’ve noticed that many military men make the “mistake” of buttoning the bottom button of their jacket. Intentional or not it plays into Bond’s military/naval quirks when dressing (i. e. preference for shoes without laces, belts, even when not appropriate for the outfit, and naval inspired blazers). What do you think Matt? All buttons are meant to fasten in military jacket styles, and I think all buttons must be buttoned as per military regulations. So it makes sense that military men might do that. But James Bond is not supposed to be one of those people. He would have known how to button a civilian suit long before he was in the military. If it wasn’t a mistake, he would have consistently buttoned his jacket incorrectly. 1) Are summer weight flannel suits / trousers available , or is it strictly a cold weather fabric ? 2) How durable is a flannel suit ? Is it more durable than a worsted ? 3) What is the typical longetivity of a flannel suit ? ( Being a lawyer , l plan to wear my twice a week to court ) . 1) Because of flannel’s dense nap, it’s never going to be a summer fabric, even in a light weight. In a light weight it’s a cool-weather fabric. 2) Flannel is less durable than worsted, especially in lighter weights. 3) It’s going to show wear after a year if you wear it twice a week. It needs two days of rest between wears. Council, so what are your thoughts on the flannel suit? I was going to get one from mason and sons but instead went with Mr.Ned. Well , Mr . Saul , it is one of my three ready made suits. It came with Brace Buttons and slide buckle side tabs ( or What you Americans call Side Adjusters ) . Since l wear all my trousers with Braces exclusively for the last 4 years , l had no need for the side tabs. I had a local tailor remove the side tabs ( which is not something l recommend that you do , unless you have a VERY good tailor . Luckily Mine was very skilled at this ). It is a fine specimen of British tailoring. Very well made and very comfortable in the colder months ( like this time of the year ). It is one of the only two suits that l own with a flat front. EVERY THING else l own , has double forward pleats. While l find most flat front trousers uncomfortable , these flannel suit trousers are quite comfortable ( although l suspect having the side tabs removed probably has something to do with it , since it made the waist band looser ) . I wear it on Mondays when l go to supreme court , and l pair it with Albert Thurston Moire braces , a Harvie and Hudson Silk shirt with detachable collars and cuffs , a starched turndown collar from New and Lingwood , and a Jacquard silk tie. That said , l probably won’t get another ( unless l received it for free or as a gift ). I like suits which are appropriate for year round wear. Especially since l live in Bangladesh and it can get very hot between February and September. This flannel suit would only be comfortable for the colder months ( like October to Late January ). I was tempted to go look for lightweight Flannel suiting , but as Matt said , Flannel has an inherent Nap , which makes ANY flannel suits uncomfortable for hot weather. I will stick to my Henry Poole and Huntsman lightweight Worsted Wool suits for wear round wear. They are much more versatile for all 12 months. Also , l prefer a worsted suit over a flannel for it’s Durability. I often have to travel to district courts and morgues all over the country and stay out of town for up to 3 or 4 days. In those situations , l invariably pack light . I just take one suit , one pair of braces , one pair of shoes and two silk shirts with me . Using a flannel suit for this application , would drastically shorten the service life of my suit , since Matt Advises not to wear a flannel suit more than once a week . For my needs , a good old Lightweight worsted wool suit , is far more durable and can easily last three or four days when l am travelling. I used to wear my flannel suit to Supreme court , every Monday and Tuesday. But after what Matt said , l will do the smart thing and wear it only on Mondays. I will use my Worsted wool suits for Tuesday , Wednesdays and Thursdays. I spent a good deal of money on the Anthony Sinclair Flannel suit and l don’t want to ruin it. Also , one odd thing which l noticed is that Flannel suits really don’t work well without ties . Since l only wear ties twice a week ( on Mondays and Tuesdays , when l am at Supreme court ) , l prefer worsted wool suits for every day wear. They work better with my open neck attached collar silk dress shirts. Also , It’s not even durable enough for country wear , like the Tweed suit l wear for Deer hunting. So it is really not a very versatile suit for my needs. But it is still a far better purchase than the Dupioni Silk suit , l once got from Anderson and Sheppard . Pure Silk wears very poorly in a suit and true enough , the trousers wore through in certain areas in less than a year ( l would wear it twice a week ). I lost a lot of money by ordering that silk suit and l vowed never to buy another silk suit again. To answer your question , l would highly recommend it , but Only for certain uses.